The Morgan Plus 4 is a classically styled British sports car that uses up-to-date components in a traditional frame. How does the marriage work? As ever with Morgan, new doesn’t necessarily mean new. The Plus 4 still retains all of the trademark Morgan touches, such as a frame crafted from ash and hand-beaten body panels. However, the Plus 4 now gains a 2.0-litre engine sourced from Ford as well as a Mazda-sourced five-speed manual gearbox – so it’s not all elements of yesteryear. Of course, you don’t just buy into the car, but the excellent attention to detail that Morgan provides, which is why they remain quite so popular – and why the Malvern-based carmaker’s order books remain so constantly full. The Morgan Plus 4 is a pretty thing, there’s no doubt about that, with every swoop and curve painstakingly crafted. The wire wheels on all four corners sit at just the right level, while the prominent front grille that is so synonymous with Morgan cars looks just as at home as always. Morgans have a truly steadfast image. Because their styling hasn’t changed all that much throughout the years, they remain timeless and because of the factory’s relatively low yearly output, they stay in demand. Any Morgan car is known for its hand-built, made-in-Britain image, and the Plus 4 certainly is in keeping with this. As a two-seater, classically designed sports car, the Plus 4 was never going to be all that practical. However, the boot area behind the seats is surprisingly large, while side pockets and a deceptively deep glove box mean there’s a bit more room than you’d expect. Certainly, there’s enough storage space in the rear of the car for two soft weekend bags – though you’ll struggle to fit anything substantial in there. Getting in and out of the Plus 4 can be a bit of a struggle given the car’s low ride height, but once you’re in it the Morgan proves to be a comfortable place to be. It’s snug, but the good support offered by the quilted leather-clad sports seats and space given by the elongated footwell mean that it’s not as harsh a place to be sat over long journeys as you’d think. As soon as you press the large starter button and the 2.0-litre engine crackles into life, it’s clear that the Plus 4 is going to afford one heck of a driving experience. 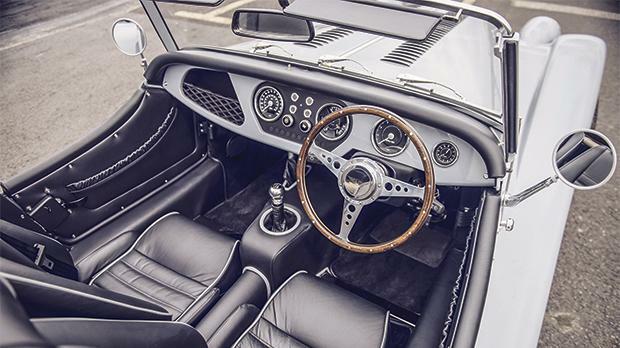 The upright driving position, with the steering wheel right up in your chest, is classic British sports car, while the pedal position means that it’s easy to get comfortable. Up and running, the Plus 4 certainly provides a lot of drama. The sports exhaust cracks and pops on overrun, with the engine singing throughout the rev range in a wholeheartedly lovely manner. Of course, the unassisted steering is exceptionally heavy at low speeds, but up and running it really feels alive – though its lack of precision does mean you have to judge your place on the road a little more carefully than you would in other cars. The engine suits the car nicely. Though lacking the supreme punch afforded by the V8 engine fitted in the larger Plus 8 model, it has enough shove to whisk you down the road at a quick enough pace. Because of the Plus 4’s low-slung driving position, even moderate speeds feel terrifically fast, and the slick gearshift means that it takes just a flick of the wrist to get the Morgan back up to speed. There’s plenty of response from the throttle too, and while those looking for out-and-out performance may want to go elsewhere, the Morgan truly is a giggle to drive – especially on twisting roads, where it is best suited. The Morgan Plus 4 isn’t cheap. Given the breadth of trims, paint colours and interior touches to choose from it’s hard to put a price on one – but you’ll be looking at a budget close to €50,000, and that’s before you start ticking option boxes. However, Morgan cars do hold their values exceptionally well and have a solid owners’ club too. They’re also built well, and given the Plus 4’s utilisation of a Ford engine, reliable as well. 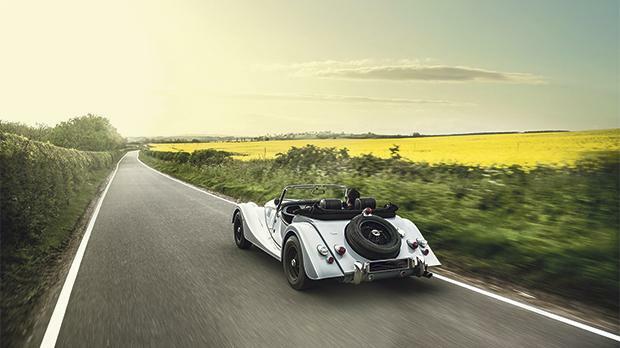 Morgan claim that you should see over 30mpg in the Plus 4, and it certainly appears to be just as economical out on the road – it uses a lot less fuel than you’d think. However, the biggest way that this car justifies its price is the way it makes you – and others – feel. There’s no other car like it for putting a smile on the face of passers-by, and it does equally well with those inside the cabin too. Can you put a price tag on this? Probably not, and that’s why the Plus 4 is such an irresistible package.